Power over Ethernet is ideal for powering and controlling wall clocks and other time devices. The accuracy of a network’s NTP time server can be used to maintain an accurate time on the PoE clock. This means the clock will never drift and will always be accurate to the second – ideal for ensuring punctuality in organisations that runs to a tight time schedule. No matter how many clocks are running on the PoE system, they will all maintain the exact same time, eliminating time inconsistencies in large organisations. Network time protocol (NTP) is used as a synchronisation tool by most computer networks. NTP distributes a single time source around a network and ensures all devices are running in synchronisation with it. NTP is highly accurate and able to keep all machines on a network to within a few milliseconds of the time source. However, where this time source comes from can lead to problems in time synchronisation within a network. The construction of clock, designed to tell the time for 10,000 years, is underway in Texas. The clock, when built, will stand over 60 metres tall and will have a clock face nearly three metres across. 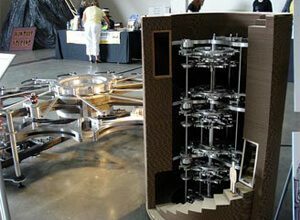 Built by a non-profit organisation, the Long Now Foundation, the clock is being built so as to, not only still be standing in 10,000 years, but also still be telling the time. Consisting of a 300kg gear wheel and a 140kg steel pendulum, the clock will tick every ten seconds and will feature a chime system that will allow 3.65 million unique chime variations—enough for 10,000 years of use. Inspired by ancient engineering projects of the past, such as the Great Wall of China and the Pyramids—objects designed to last, the clock’s mechanism will feature state-of-the-art materials that don’t require lubrication of servicing. However, being an mechanical clock, the Long Now Clock will not be very accurate and will require resetting to avoid drift otherwise the time in 10,000 years will not represent the time on Earth. Even atomic clocks, the world’s most accurate clocks, require help in preventing drift, not because the clocks themselves drift—atomic clocks can remain accurate to a second for 100 million years, but the Earth’s rotation is slowing. Every few years an extra second is added to a day. These Leap Seconds inserted on to UTC (Coordinated Universal Time) prevent the timescale and the movement of the Earth from drifting apart. UTC is the global timescale that governs all modern technologies from satellite navigation systems, air traffic control and even computer networks. While atomic clocks are expensive laboratory-based machines, receiving the time from an atomic clock is simple, requiring only a NTP time server (Network Time Protocol) that uses either GPs or radio frequencies to pick up time signals distributed by atomic clock sources. Installed on a network, and NTP time server can keep devices running to within a few milliseconds of each other and of UTC. If you’ve ever tried to keep track of time without a watch or clock, you’ll realise just how difficult it can be. Over a few hours, you may get to within half an hour of the right time, but precise time is very difficult to measure without some form of chronological device. Before the use of clocks, keeping time was incredibly difficult, and even losing track of days of the years became easy to do unless you kept as daily tally. But the development of accurate timepieces took a long time, but several key steps in chronology evolved enabling closer and closer time measurements. Today, with the benefit of atomic clocks, NTP servers and GPS clock systems, time can be monitored to within a billionth of a second (nanosecond), but this sort of accuracy has taken mankind thousands of years to accomplish. With no appointments to keep or a need to arrive at work on time, prehistoric man had little need for knowing the time of day. But when agriculture started, knowing when to plant crops became essential for survival. 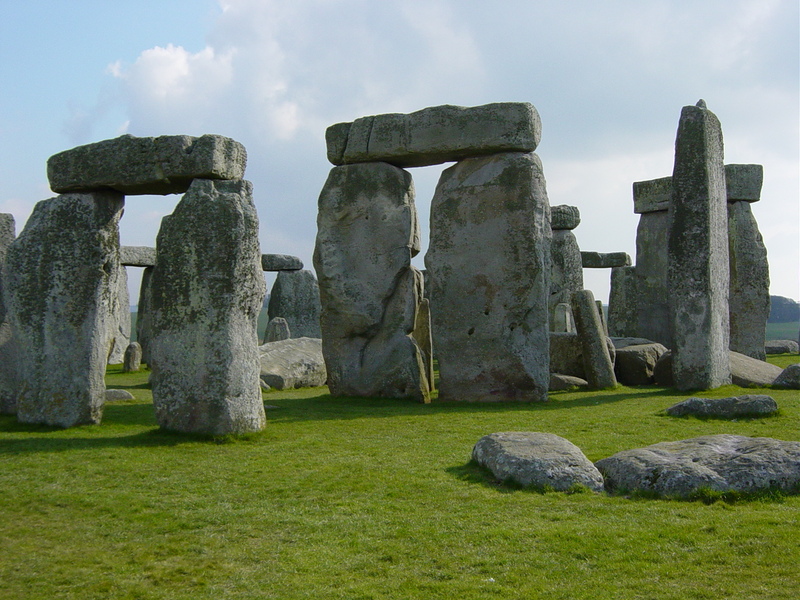 The first chronological devices such as Stonehenge are believed to have been built for such a purpose. Identifying the longest and shortest days of the year (solstices) enabled early farmers to calculate when to plant their crops, and probably provided a lot of spiritual significance to such events. The provided the first attempts at keeping track of time throughout the day. Early man realised the sun moved across the sky at regular paths so they used it as a method of chronology. Sundials came in all sorts of guises, from obelisks that cast huge shadows to small ornamental sundials. The first true attempt at using mechanical clocks appeared in the thirteenth century. These used escapement mechanisms and weights to keep time, but the accuracy of these early clocks meant they’d lose over an hour a day. Clocks first became reliable and accurate when pendulums began appearing in the seventeenth century. While they would still drift, the swinging weight of pendulums meant that these clocks could keep track of first minutes, and then the seconds as engineering developed. 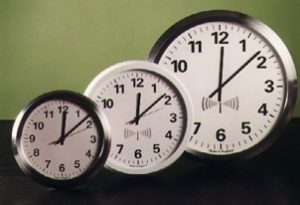 Electronic clocks using quartz or other minerals enabled accuracy to parts of a second and enabled scaling down of accurate clocks to wristwatch size. While mechanical watches existed, they would drift too much and required constant winding. With electronic clocks, for the first time, true hassle free accuracy was achieved. Keeping time to thousands, millions and even billion parts of a second came when the first atomic clocks arrived in the 1950’s. Atomic clocks were even more accurate than the rotation of the Earth so Leap Seconds needed developing to make sure the global time based on atomic clocks, Coordinated Universal Time (UTC) matched the path of the sun across the sky. When you tell somebody you’ll be an hour, ten minutes or a day, most people have a good idea how long they need to wait; however, not everybody has the same perception of time, and in fact, some people have no perception of time at all! Scientists studying a newly discovered Amazonian tribe have found that they have no abstract concept of time, according to news reports. The Amondawa, first contacted by the outside world in 1986, while recognising events occurring in time, do not recognise time as a separate concept, lacking the linguistic structures relating to time and space. Not only do the Amondawa have no linguistic ability to describe time, but concepts like working throughout the night, would not be understood as time has no meaning to their lives. While most of us in the western world tend to live by the clock, we all in fact have continuous different perceptions of time. Ever noticed how time flies when you’re having fun, or goes very slowly during times of boredom? Our time perceptions can vary greatly depending on the activities that we are undertaking. Fighter pilots, Formula One drivers and other sportsmen often talk of “being in the zone” where time slows down. This is due to the intense concentration they are putting into their endeavours, slowing down their perceptions. Regardless of out differing time perceptions, time itself can alter as Einstein’s Special Theory of Relativity demonstrated. Einstein suggested that gravity and intense speeds will alter time, with large planetary masses warping space-time slowing it down, while at very high speeds (close to the speed of light) space travellers could partake a journey that to observers would seem several thousands of years, but be just seconds to those travelling at such speeds. And if Einstein’s theories seem far-fetched, it has been tested using ultra-precise atomic clocks. Atomic clocks on aeroplanes travelling around the Earth, or placed farther away from the Earth’s orbit, have minute differences to those remaining at sea-level or stationary on Earth. Atomic clocks are useful tools for modern technologies and help to ensure that the global timescale, Universal Coordinated Time (UTC), is kept as accurate and true as possible. And you don’t need to own your own tomake sure your computer network is kept true to UTC and is hooked up to an atomic clock. NTP time servers enable all sorts of technologies to receive an atomic clock signal and keep as accurate as possible. You can even buy atomic clock wall clocks that can provide you the precise time no matter how much the day is “dragging” or “flying”. The ‘sat-nav’ has revolutionised the way we travel. From taxi drivers, couriers and the family car to airliners and tanks, satellite navigation devices are now fitted in almost every vehicle as it comes off the production line. While GPS systems certainly have their flaws, they have several uses too. Navigation is just one of the main uses of GPS but it is also employed as a source of time for GPS NTP time servers. Being able to pin point locations from space has saved countless lives as well as making travelling to unfamiliar destinations trouble free. Satellite navigation relies on a constellation of satellites known as GNSS (Global Navigational Satellite Systems). Currently there is only one fully functioning GNSS in the world which is the Global Positioning System (GPS). GPS is owned and run by the US military. The satellites broadcast two signals, one for the American military and one for civilian use. Originally, GPS was meant solely for the US armed forces but following an accidental shooting down of an airliner, the then President of the US Ronald Reagan opened the GPS system to the world’s population to prevent future tragedies. GPS has a constellation of over 30 satellites. At any one time at least four of these satellites are overhead, which is the minimum number required for accurate navigation. The GPS satellites each have onboard an atomic clock. Atomic clocks use the resonance of an atom (the vibration or frequency at particular energy states) which makes them highly accurate, not losing as much as a second in time over a million years. This incredible precision is what makes satellite navigation possible. The satellites broadcast a signal from the onboard clock. This signal consists of the time and the position of the satellite. This signal is beamed back to earth where your car’s sat nav retrieves it. By working out how long this signal took to reach the car and triangulating four of these signals the computer in your GPS system will work out exactly where you are on the face of the world. (Four signals are used because of elevation changes – on a ‘flat’ earth only three would be required). GPS systems can only work because of the highly precise accuracy of the atomic clocks. Because the signals are broadcast at the speed of light and accuracy of even a millisecond (a thousandth of a second) could alter the positioning calculations by 100 kilometres as light can travel nearly 100,00km each and every second –currently GPS systems are accurate to about five metres. The atomic clocks onboard GPS systems are not just used for navigation either. Because atomic clocks are so accurate GPS makes a good source of time. NTP time servers use GPS signals to synchronize computers networks to. A NTP GPS server will receive the time signal from the GPS satellite then convert it to UTC (Coordinated Universal Time) and distribute it to all devices on a network providing highly accurate time synchronization. Measuring the passing of time has been a preoccupation of humans since the dawn of civilization. Broadly speaking, measuring time involves using some form of repetitive cycle to work out how much time has passed. Traditionally this repetitive cycle has been based on the movement of the heavens such as a day being a revolution of the Earth, a month being an entire orbit of the Earth by the moon and a year being earth’s orbit of the sun. As our technology progressed we have been able to measure time in smaller and smaller increments from sundials that allowed us to count the hours, mechanical clocks that let us monitor the minutes, electronic clocks that let is for the first time accurately record seconds to the current age of atomic clocks where time can be measured to the nanosecond. With the advancement in chronology that has led to technologies such as NTP clocks, time servers, atomic clocks, GPS satellites and modern global communications, comes with another conundrum: when does a day start and when does it finish. Most people assume a day is 24 hours long and that it runs from midnight to midnight. However, atomic clocks have revealed to us that a day is not 24 hours and in fact the length of a day varies (and is actually increasing gradually over time). After atomic clocks were developed there was a call from many sectors to come up with a global timescale. One that uses the ultra precise nature of atomic clocks to measure its passing but also one that takes into account the Earth’s rotation. Failing to account for the variable nature of a day’s length would mean any static timescale would eventually drift with day slowly drifting into night. To compensate for this the world’s global timescale, called UTC (coordinated universal time) has additional seconds added (leap seconds) to ensure that there is no drift. UTC time is kept true by a constellation of atomic c clocks and it is utilised by modern technologies such as the NTP time server which ensures computer networks all run the exact same precise time. Telling the time may seem a simple affair these days with the number of devices that display the time to us and with the incredible accuracy of devices such as atomic clocks and network time servers it is quite easy to see how chronology has been taken for granted. The nanosecond accuracy that powers technologies such as the GPS system, air traffic control and NTP server systems (Network Time Protocol) is a long way from the first time pieces that were invented and were powered by the movement of the sun across the heavens. Sun dials were indeed the first real clocks but they obviously did have their downsides – such as not working at night or in cloudy weather, however, being able to tell the time fairly accurately was a complete innovation to civilisation and helped for more structured societies. However, relying on celestial bodies to keep track of time as we have done for thousands of years, would not prove to be a reliable basis for measuring time as was discovered by the invention of the atomic clock. Before atomic clocks, electronic clocks provided the highest level of accuracy. These were invented at the turn of the last century and while they were many times more reliable than mechanical clocks they still drifted and would lose a second or two every week. Electronic clocks worked by using the oscillations (vibrations under energy) of crystals such as quartz, however, atomic clocks use the resonance of individual atoms such as caesium which is such a high number of vibrations per second it makes the incredibly accurate (modern atomic clocks do not drift by even a second every 100 million years). Once this type of time telling accuracy was discovered it became apparent that our tradition of using the rotation of the earth as a means of telling time was not as accurate as these atomic clocks. Thanks to their accuracy it was soon discovered the Earth’s rotation was not precise and would slow and speed up (by minute amounts) each day. To compensate for this the world’s global timescale UTC (Coordinated Universal Time) has additional seconds added to it once or twice a year (Leap seconds). Atomic clocks provide the basis of UTC which is used by thousands of NTP servers to synchronise computer networks to.